L’artiste et éditeur de livre Li Hongbo, basé à Pékin, réalise toute une série d’oeuvres sur le thème du corps humain. Fasciné par les jouets chinois traditionnels et les décorations festives, il s’inspire de ce principe pour concevoir ses projets. Ce qui semble d’abord être de banales mais délicates sculptures en porcelaine sont en réalité composées de milliers de couches de papier blanc dissimulant un secret. Li Hongbo es un artista de origen chino cuyas esculturas están conformadas por miles de hojas de papel y pegamento. Mediante una técnica tradicional china muy conocida comúnmente y utilizada para realizar juguetes para niños, Hongbo explora la maleabilidad del medio esculpiendo el material para dar vida a verdaderas obras de arte, mayormente con figuras humanas. Al unir 30.000 hojas de papel colocadas estratégicamente y formando enormes bloques que dan la apariencia de madera, el artista luego talla los bloques hasta dar con la forma deseada. La flexibilidad del material sumado a la técnica utilizada provee movilidad a las esculturas, experimentando con distintas formas surrealistas y dando la facilidad al artista de estirar las piezas alrededor de las salas en las cuales exhibe su trabajo. Se engana quem pensa que as obras de Li Hongbo são feitas de gesso. As esculturas são realmente sólidas, mas são todas feitas em papel puro branco. Esta colagem de folha por folha em formas de bustos, mãos, ossos, adquirem uma capacidade de expansão surpreendente. Li Hongbo, born 1974 Siping City Jilin, China, Lives and works in Beijing. Li Hongbo creates artworks as sculptural forms entirely out of paper. Taking his inspiration from the honeycomb forms created through traditional Chinese techniques often used in Chinese festive decorations and children’s toys known as ‘paper gourd’ which create story telling shapes and symbols from a stack of interconnected sheets. 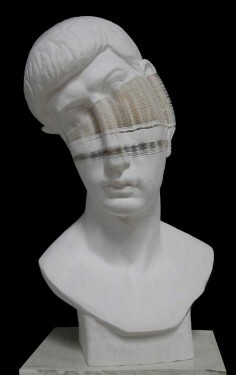 Li Hongbo originally started out working in an advertising company before studying at the China Central Academy of Fine Arts within the Experimental Arts Department. Hongbo’s artworks are created using just paper and glue. Figures, portraits, trees and vases stretch out into concertina forms creating new representations through shape, pattern and texture. One such work is the installation, Ocean of Flowers(2012), the installation contains thousands of brightly coloured honeycomb shapes, set out as a magical landscape for the viewer to explore, however, when the flowers are flattened (flat packed) their shapes resemble guns such as pistols and AK 47s. The artwork is designed so that the viewer is not instantly aware of what the flowers represent, drawing the audience into something beautiful only to find out that the flowers are actually weapons of war. Experimenting with the creation of art through just one simple, everyday material, Hongbo ignites and captivates the viewers own imagination through his abstract, curving forms. Desire causes damage, damage results in hatred, hatred accumulates conflicts, conflict leads to war. Weapons are for war, not merely defend yourself but also to annihilate others. However all people are born of lust and destroyed by the same thing. This is the formation of blood and tears from thousands of years of human history and suffering, but also as the result. The ‘flower’ in my work looks so bright and grandstanding, whether people can really comprehend the damage hidden behind it. When the muzzle points to any creature, no matter for what purpose, it represents the end of life or a painful struggle. We are all losers when the fall of lives reveal in our sight. Where there is a life, strong or weak, long or short, large or small, coarse or fine, near or far, visible or invisible, born or to be born, all should be lived with infinite kindness and a heart to love. Do not do harm to others because of your own selfishness. The designer of AK47 once said that the purpose of manufacturing weapons is always for self-defence, not to kill. If this principle can be widely accepted, the world will not need weapons. Скульптуры художника Ли Хунбо (Li Hongbo) состоят из тысячи слоев мягкой бумаги, хотя кажется, будто они из гипса. Объекты очень эластичны, их можно растягивать в разные стороны. Вдохновением для такого направления стали традиционные китайские игрушки и декоративные изделия из бумаги.